Maintaining the health of pigs is vital in pig farming and production. 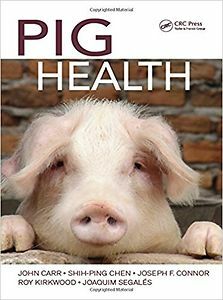 This new book written by experts from around the world focuses on the health of pigs, first with coverage of the disorders of pigs organised by clinical sign and body system. The book explores environmental medicine and then health maintenance. Treatment options are discussed, emphasizing a reduction in antimicrobial use and an increased awareness of a holistic approach to treatment. The book includes over 600 high-quality illustrations to enhance the clinical description, as well as a wealth of high-quality videos to test the reader in making differential diagnoses with treatment options. Quizzes at the end of each section also encourage reflective learning. Clinical examination of the individual pig and groups are covered along with environmental medicine, making this the ideal reference for veterinary practitioners and students. Those interested in population medicine (poultry, aquaculture, cattle and small ruminant and apiaries) will particularly enjoy the holistic approach to veterinary medicine. All those who appreciate the many talents of pigs will enjoy the practical approach to managing the health of their animals. This book moves veterinary science forward, promoting health rather than treating disease. It will be your number one reference for keeping your pigs healthy.